I've had a lot of problems getting a workflow that allows me to efficiently get meeting notes out to the meeting participants. The requirements are that I end in the body of a Microsoft Outlook 2011 message to send to the folks that attended. The reason is that in our company, like most others these days, are busy enough that opening an attachment is enough friction to stop folks from reading the notes. This work process is when I am running the meeting and the meeting notes are to confirm Next Actions / Owners / Timing as well as for my ability to follow-up. I cannot hook my iPad up to the company network to easily transfer files.? Box.net is the approved cloud service. Dropbox is not allowed. I am back to back most days in meetings and don't have much time to work the meeting notes. iPad hand written in Notability or NoteTaker HD - transcribe into email. This was far too much rework. We're not allowed to hook our personal devices like our iPad's to the company network so there is friction getting the notes off of the iPad and back to my work Mac. I don't type fast enough on the iPad to keep up during the meeting.Does not work for me. This workflow failed miserably. I often failed to send out the notes rapidly enough to be effective. Circus Ponies Notebook - This was effective for capturing outlines but the translation into Outlook was horrible. I used this program as an archive for my files and meeting notes for almost a year but ultimately, the inability to easily spotlight search the files effectively (I had embedded the files in the notebooks) became a deal breaker. I still have to go back to these notebooks to find information and its not easy enough. Omni-Outliner - also effective for note taking but translation into Outlook was wonky. There were some strange formatting issues and I spent a lot of time reformatting. Having to export to RTF or .doc was another source of friction. Outlook - this was passable but taking notes was a bit rougher than I would like. 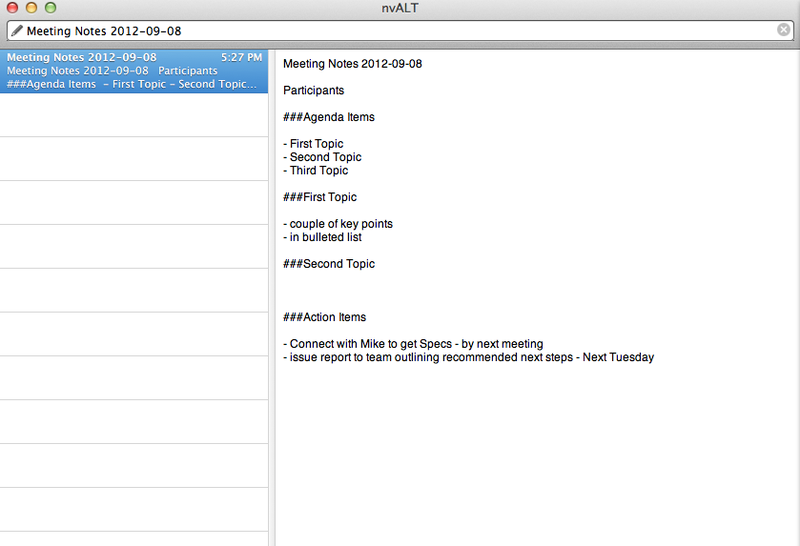 Currently, I'm using nvAlt to take notes using simple markdown. I've set the default fonts in the markdown preview to the same that I use in Outlook and simply copy the notes from the preview into Outlook. I am only about 2 weeks into this but its much better than the other work flows. How do I know its helping. The only meeting notes I've failed to issue were when I was running presentations and couldn't take notes at the same time. The iPad to Outlook friction pops up at that point. Clearly, I need a text editor on the iPad that syncs with Box.net and I should solve that end.